1984 – Jesse Jackson Secures Release of Black Pilot. 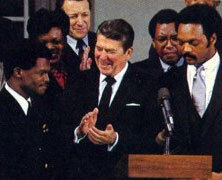 On this date in 1984, Reverend Jesse Jackson was able to secure the release of a U.S. Bombardier Navigator. Lt. Robert Goodman was part of a crew on a bombing mission over Beirut when his plane was hit by a missile. It crashed, killing the pilot and injuring Goodman. He was captured by Syrian troops and taken to Damascus where he was held for 30 days. The United States tried repeatedly to secure his release but to no avail. 1989 – The Arsenio Hall Show Premieres. The Arsenio Hall Show premieres on this date in 1989. It is appeared in syndication until 1994 and was the first late night talk show regularly hosted by a Black entertainer. Hall appealed to a younger, hipper audience than hosts like Johnny Carson or Tom Snyder. He brought in new musical acts and interacted with his audience in a manner that was fresh and new. The show was distributed by Paramount and taped at the Paramount studios in Los Angeles. On this date in 1961, Adam Clayton Powell, Jr. was elected Chairman of the House Education and Labor Committee. In this position he presided over several federal social programs. Under his leadership, Congress expanded the minimum wage, implemented programs for the disabled and enacted aid to benefit elementary and secondary schools. His committee was instrumental in enacting major parts of President Kennedy’s “New Frontier” and President Johnson’s “Great Society” social programs and the War on Poverty. 1624 – William Tucker Born. William Tucker was born on this date in 1621 and is believed to have been the first African-American born in the American colonies. He was born in Jamestown, Virginia, the son of slave parents named Isabella and Anthony. He was sold years later to a British sea captain.